Early this morning Korea time, Samsung LSI announced their newest generation flagship SoC, the Exynos 9820. The Exynos 9820 succeeds this year’s Exynos 9810, which we’ve covered extensively both in our review of the Galaxy S9, as well investigated in separate pieces, ending with an official microarchitectural disclosure of the M3 core at HotChip 2018. 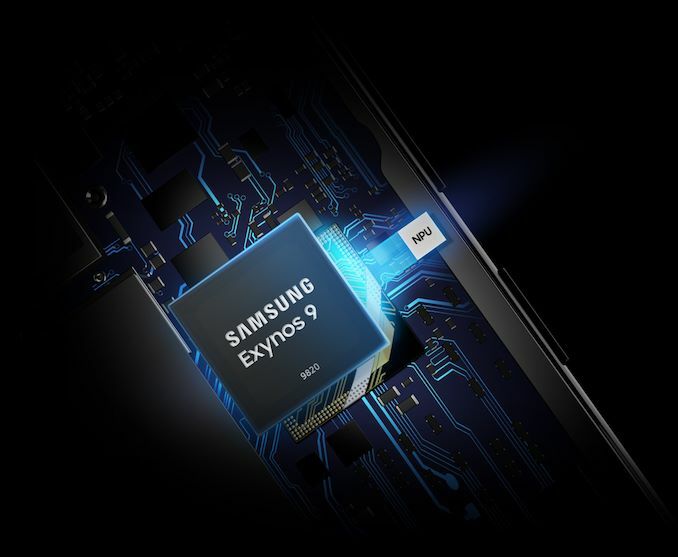 The Exynos 9810 was not a very successful chip, as the M3 microarchitecture as well as the implementation had some severe flaws, with actual devices based on the chip largely lagging behind their Snapdragon counter-parts, having to sacrifice a lot of performance in order to keep up with battery efficiency, and even then, failing to do so most of the time. The new 9820 now fundamentally changes the CPU configuration from a 4+4 setup, to a 2+2+4 setup, where we now have two fourth generation Samsung CPUs as the top performing units, two Cortex A75 CPUs as the mid-tier performance cores, and four Cortex A55 CPUs for maximum power efficiency. First of all, the new CPU configuration is rectifying one of the issues of the Exynos 9810: Here, the A55 cores were on a separate cluster block on the SoC, and thus cache coherency to the performance cores had to go through the SCI/interconnect, which undoubtedly impacted efficiency. On the Exynos 9820, all CPUs, including the Cortex CPUs, are now integrated within the same cluster and the new L3 is a cache hierarchy to all CPUs, undoubtedly not only improving power efficiency, but also performance of the smaller cores now. The new L3 cluster is very much similar to Arm’s DynamIQ DSU, however it’s of Samsung’s own design as Arm doesn’t allow third-party cores to plug into the DSU. 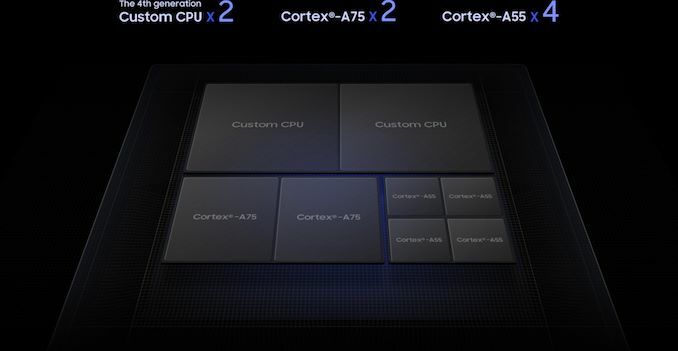 The choice of a Cortex A75 as a mid-tier CPU group is evident: Having four big cores such as the M3 or evidently the M4 is very much a waste of die space because in a mobile power envelope, the four cores will never be able to operate at their maximum frequency / performance. So instead of using the same big microarchitecture at a lower clocked configuration, it makes sense to just use a smaller CPU and regain some of the die space. What this also allows Samsung to do is to further optimise the big custom cores for peak frequencies and performance as they no longer have to value the lower-end of the power curve as much, something which is now covered by the A75’s. In terms of the new fourth generation custom CPU, the M4 (If they’ll end up naming it like that) is advertised to have “enhanced memory access capability”. As we’ve covered the microarchitectural disclosure of the M3, Samsung did admit the cache hierarchy was one of the last pieces that was designed for the IP, and it seemed evident that there were some compromises made. The memory hierarchy and the memory subsystem of the M3 did seem the Achilles heel of the microarchitecture, as it seems to prevent the core reaching higher performance levels that you’d normally expect from such a wide core. The new M4, as per the marketing materials, now promises a 20% boost in performance, or a 40% increase in power efficiency when compared to the Exynos 9810. I’m still working on the review of the Mate 20’s and the new Cortex-A76 sporting Kirin 980, which should be published soon enough, but these improvement claims from Samsung do not seem sufficient to be able to remain competitive and catch up to the Cortex A76. Here Samsung would need to both showcase a 20% improvement in performance, while at the same time improving power efficiency by 50% in order to catch up with the Kirin 980. Unfortunately the gap currently seems far too big for the 9820 to be able to overcome, unless of course it beats the advertised marketing figures. One thing that S.LSI didn’t announce today was any kind of frequencies. For the Exynos 9810 they had chosen to advertise some unrealistically high clocks of “up to 2.9GHz”, however these weren’t achievable without some absurd power figures. Along with the IPC upgrades of the new core, I’m expecting the M4 to remain in the 2.5-2.7GHz range, with Samsung hopefully abstaining from going too high in the far end of the voltage curve. The Cortex A75’s should hopefully be in the lower 2GHz range in order to also take advantage of the better efficiency points. On the GPU side of things, the Exynos 9820 now offers Arm’s new Mali G76 in an MP12 configuration. This represents a 33% increase in the execution engines over the G72MP18 of last generation, and Samsung materials advertise a 40% increase in performance at the same power, or a 35% increase in efficiency at the same performance. On the Kirin 980 the new G76 made some very large improvements, however it just missed the mark in terms of my projections. However S.LSI was always able to achieve much better results than HiSilicon, so the new G76 in the 9820 might very well end up being respectable, even though again I’m not expecting it to match up again Apple’s best and Qualcomm’s next generation. The new 9820 also features a new first for S.LSI: The new chip now for the first time features an NPU (Neural Processing Unit). Details of the new IP are severely lacking, and all we know about it is that Samsung promises it being used for enhancing photo captures or use-cases such as AR, and it to be "7x faster" than the Exynos 9810 in its tasks. In terms of media capabilities, the new SoC’s encoder IP now promises 8K30 capability. Now I’m not really expecting new devices to be able to be able to capture in this mode as it’ll also require camera sensor support – but having a robust media encoder like this can also point out to improved recording power efficiency. The new modem now features LTE connectivity up to Category 20 in download and upload, achieving up to 2Gbps at 8CA in downstream and 316Mbps at 3CA in upstream. One thing that Samsung didn’t highlight in its announcement but is listed in the specifications, is the fact that the SoC now support UFS 3.0 storage. The new standard will be able to double up on the transfer speeds compared to UFS 2.1, achieving a theoretical max of 2.9GB/s. Lastly, but not least, the new Exynos 9820 is manufactured on an 8nm LPP process node from Samsung. 8LPP is an evolution of 10LPP and promises improved power consumption by up to 10%. Here the advertised improvements are relatively meagre, and some people will be questioning if this will be enough to compete with TSMC 7nm node in the current Kirin 980 as well as the upcoming Snapdragon. While it does look like Samsung will have a density disadvantage, I’m not expecting the performance and power disadvantage to all that dramatic. Still, the Exynos 9820 will have a tough time this year, both on the microarchitectural and process node side. Overall – the new Exynos 9820 should bring much needed improvements compared to its predecessor, however the competition this year will be extremely tough. Here I do hope Samsung makes the best of the silicon and is able to also have a good software stack, as the new tri-group CPU configuration will need a good scheduler. The new Exynos 9820 is planned to go into mass production by the end of the year, and we’ll evidently see it next spring in the new Galaxy S10. Andrei, it looks to me like you're making a surprisingly illogical and ironical mistake in your expectations based on Samsung's CPU improvement claims. Ironical because you always stress that performance is about real life and sustained metrics and not the absolute claims. And why would you be so certain of this? The Kirin 980 is 8-15% faster than the 9810 while using half the energy. I'll have the review on this up soon enough. Samsung's 20% improvement *or* 40% efficiency gain claims are simply not enough. Half the power? So faster and so frugal? 5nm?? Umm there are voices that very recent phones, iPhone XS included, are a delusion in real usage power consumption, worse than older generation phones. Why to go on 7nm if your phone give you bye bye in a short time. For few more fps on a game?? Um, because that's how these claims always work. Let me rephrase..the Kirin 980 is faster in your benchmarks where Samsung's 9810 was throttled down to basically half of what it theoretically should've been capable of. Samsung basically only needs to make sure their chip actually works normally this time, nevermind the theoretic peak value improvement numbers. > where Samsung's 9810 was throttled down to basically half of what it theoretically should've been capable of.